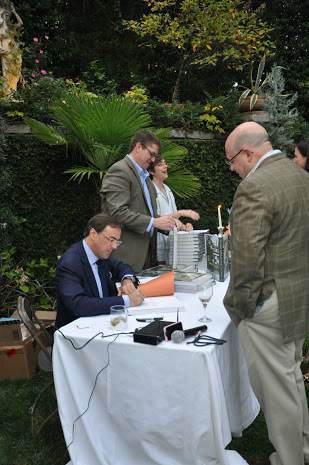 The Institute of Classical Architecture and Art (ICAA) Southeast and Joane and Norman Askins hosted a wonderful evening last fall to celebrate the publication of architect Gil Schafer’s new book, The Great American House. 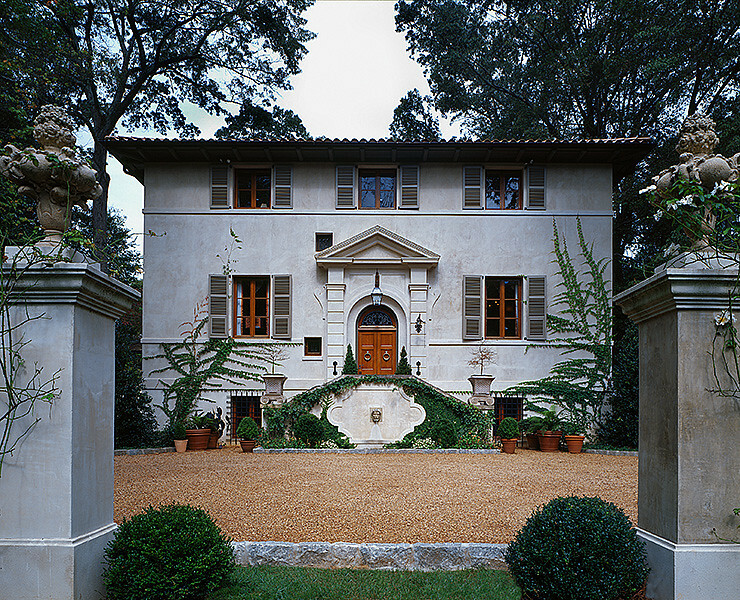 In addition to the wide array of lectures and educational opportunities that the ICAA-SE offers to its members, the ICAA-SE will be hosting members only events at notable houses around Atlanta. This clearly has great appeal to members like me, who are architecture, art, and design aficionados and enjoy seeing first hand some of the privately owned architectural gems in this city. 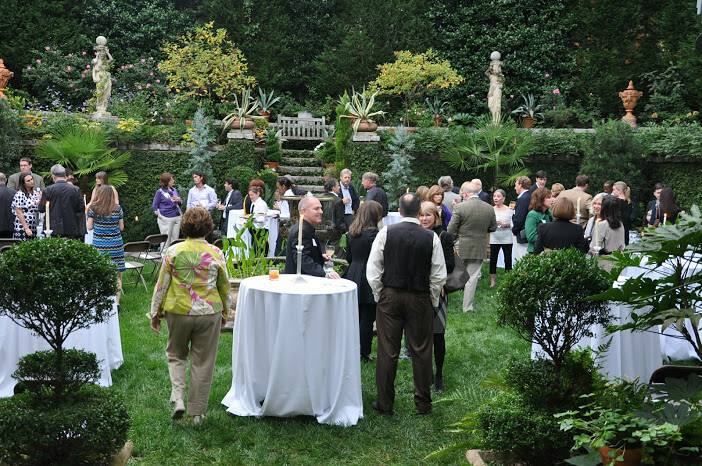 Last year was the beginning of this quarterly series, and there were several amazing events – the cocktail reception for Gil Schafer at Norman Askins’ house (featured in this post), a Bobby McAlpine lecture at a house he designed, a cocktail party at a magnificent and historic 1920s estate in Buckhead (with comments by the architect and landscape designer who worked on the renovation). More ICAA-SE members only events are planned for this year – later in the post I will link to the membership page of the ICAA-SE for those who are interested in joining. 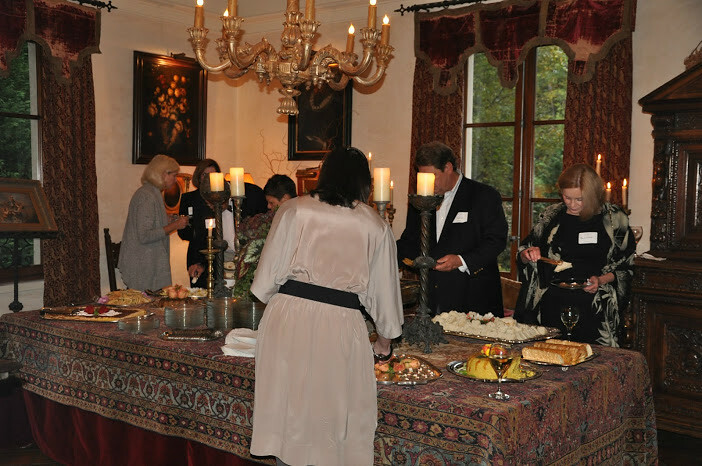 But first, a glimpse into the wonderful event last fall at Norman Askins’ house. 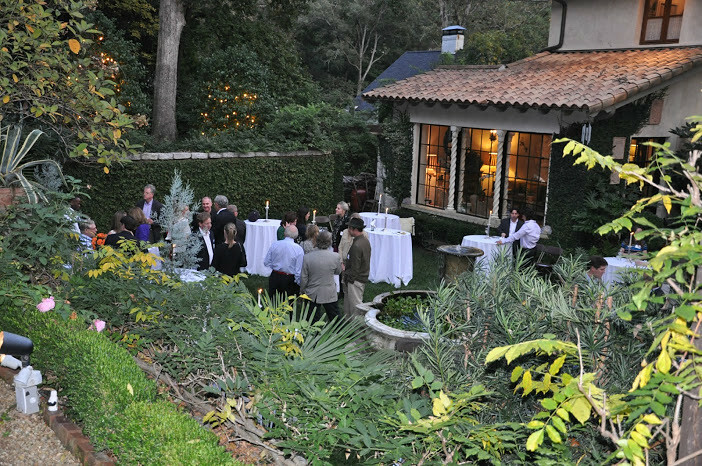 On a beautiful fall evening, Joane and Norman Askins’ lovely Italian style villa was the setting for an ICAA-SE sponsored cocktail party celebrating architect Gil Schafer’s new book, The Great American House. Mr. Askins (pictured above, greeting guests as they arrived) is one of Atlanta’s most treasured architects, and continues the great architectural legacy of the most revered classicist architects from Atlanta’s past. 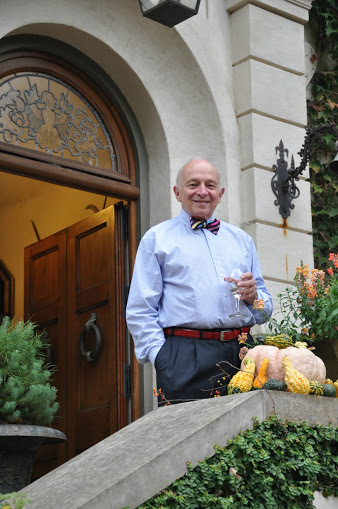 His own house is exquisite, and the perfect setting for an event that featured another architect (Gil Schafer) who continues the tradition of classical architecture in America. The Askins’ villa is beautifully placed in its environs, rising on a crest above the street. Although the house is only 10 years old, it is so perfectly at home in its surroundings that it appears to have been there for generations. A picture from Norman Davenport Askins Architect website shows another view of the house, perhaps when it was only a few years old – the creeping fig and the landscape design had just started to take root. The evening began with a cocktail hour in the Askins’ charming walled garden in the back. When you are in the garden, it is truly easy to forget that you are in Atlanta! Although it is hard to see in this picture, there is a beautiful fountain in the center of the garden. A view of the garden from above – as the sun set, the twinkling white lights in the trees looked beautiful. 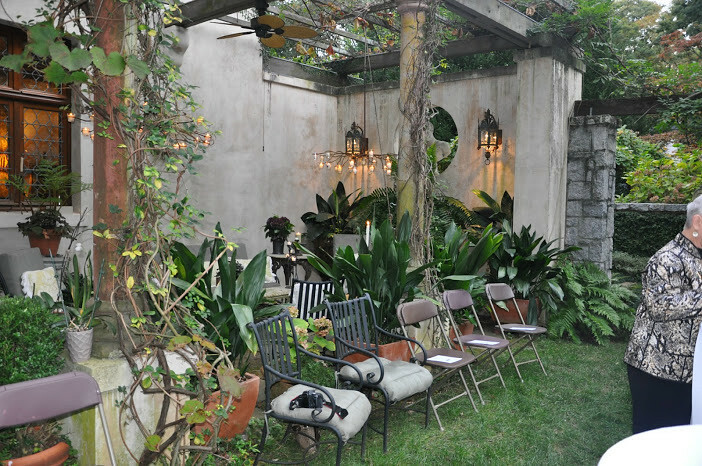 Chairs were set along the edge and in the loggia, ready for the presentation by architect Gil Schafer. Mr. Schafer signed copies of his new book The Great American House before he spoke to the group. The sun had set by the time Mr. Schafer spoke. It was not a prepared lecture, but rather an informal question and answer time with the rapt audience. Mr. Schafer spoke of his childhood influences (which include his grandparents pink plantation in South Georgia), and what inspired him to write the book. There was an elegant buffet set up in the dining room. The table was covered with a beautiful tapestry, and candles lit the room from all around. 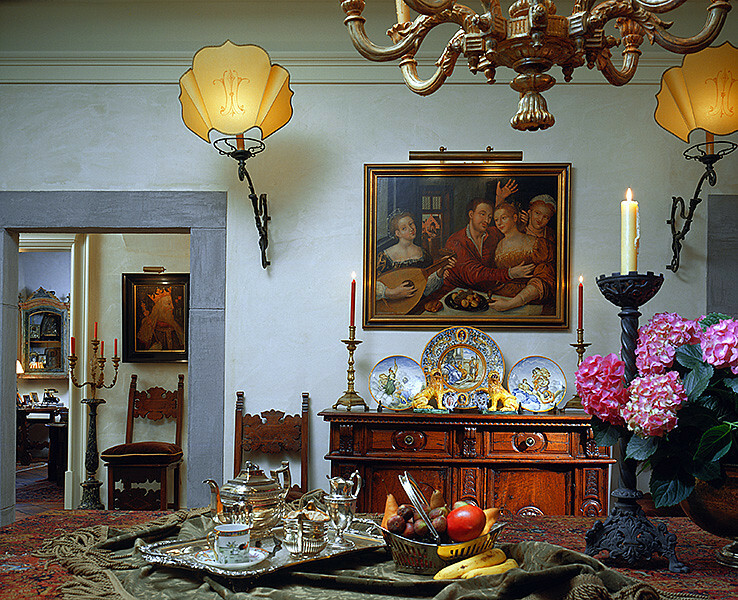 A picture of the Askins’ dining room from Norman Davenport Askins Architect website shows the other side of the room, and the items collected from a lifetime of travels. 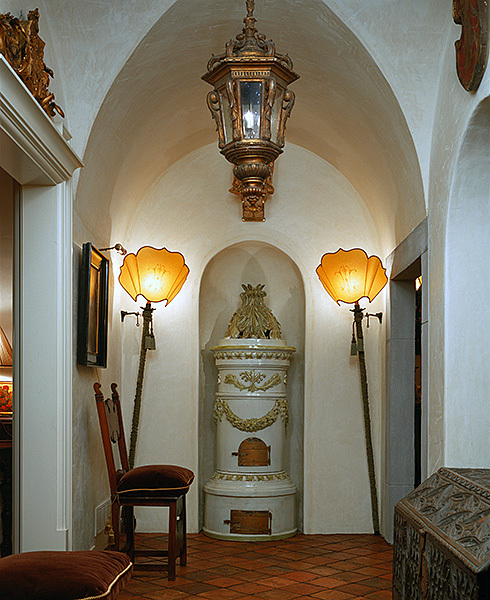 The passageway between the dining room and the living room features an interesting antique – I can’t remember what it is, although I know someone told me! Note the groin vault ceiling and the gorgeous lantern. Photo from Norman Davenport Askins website. The living room was soon full of people, but this is as it appeared before the party got started. A professional picture of the same room. 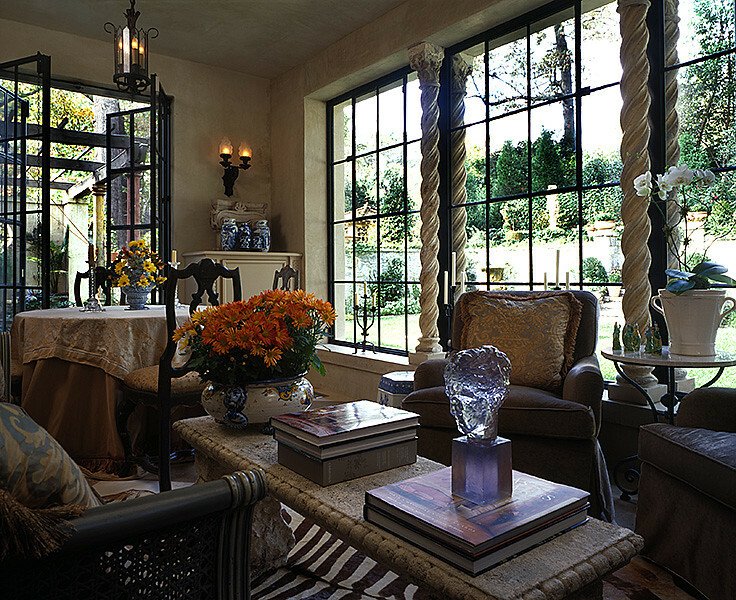 The rich colors and beautiful textiles make the room very warm and welcoming. Photo from Norman Davenport Askins website. The seating area near the fireplace, on the other side of the room. Photo from Norman Davenport Askins website. I couldn’t resist including a picture of the kitchen. 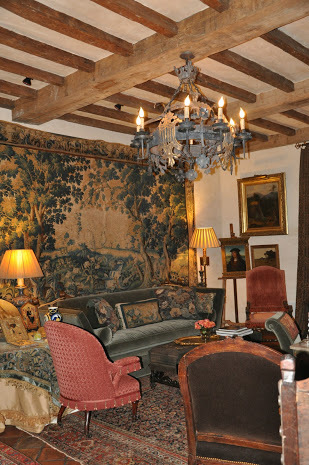 As the room is separately defined from the main rooms of the house, it was not on the path of the party (the caterers were set up in here), but it is so charming and European that I thought my readers would enjoy seeing it. I always love seeing a narrow European style kitchen table in the heart of a kitchen. Photo from Norman Davenport Askins website. The breakfast room/sunroom. Photo from Norman Davenport Askins website. The powder room is very special. Photo from Norman Davenport Askins website. 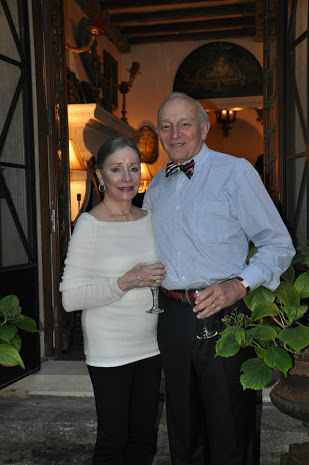 Many thanks to the wonderful hosts of the evening, Joane and Norman Askins. 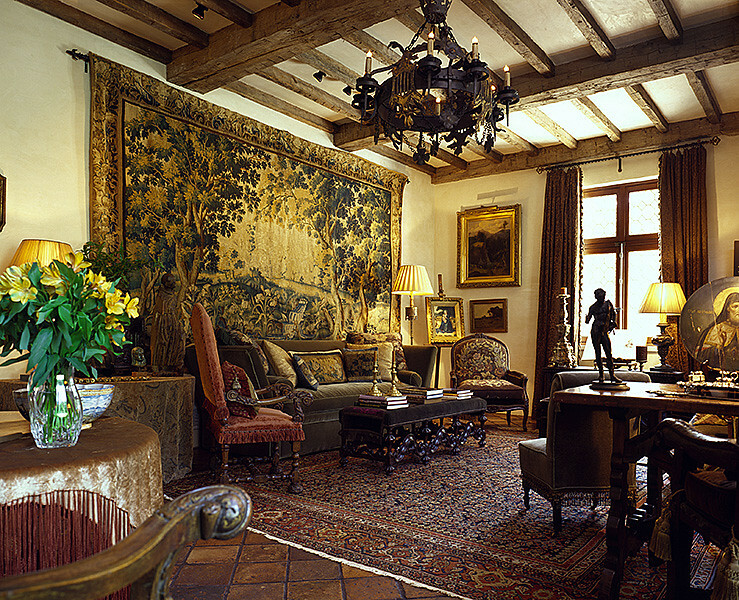 Norman’s firm’s website can be seen here - http://www.normanaskins.com/ – it is full of many beautiful and inspiring projects that his firm has completed over the years. 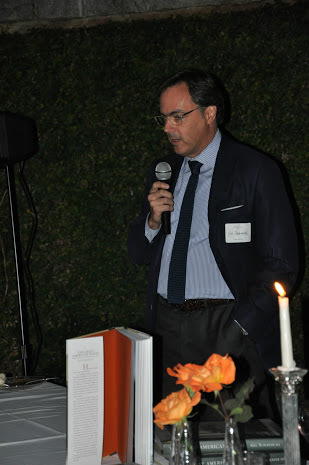 Many thanks to architect Gil Schafer, for writing such an inspirational book and giving his rapt audience an insider’s look into the process of writing the book and some of the houses featured in the book. And finally, thank you to the ICAA-SE and the sponsors of the evening, who made the event possible: Design Lighting Group, Soiree Catering, Parc Monceau, Ludowici Roof Tile, Vintage Lumber, and Custom Artisan Group. To purchase Gil Schafer’s new book, please visit the Amazon page. 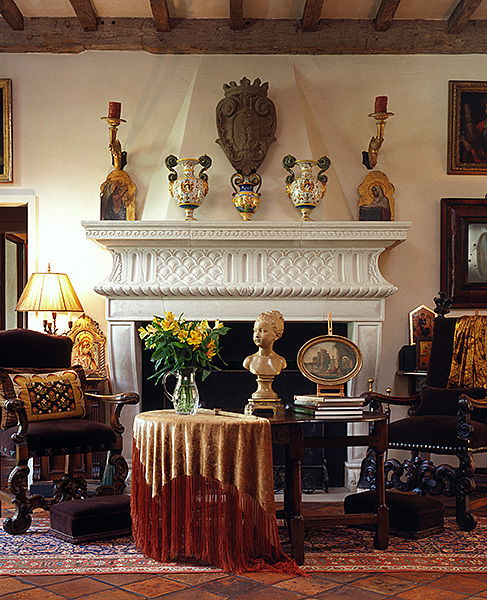 It is a wonderful book (Bunny Williams wrote the foreword), and is full of incredible pictures of many of Mr. Schafer’s projects, and details the thought behind the design or restoration of the houses, the landscape, and their interiors. The book is divided into two parts – the first part covering the philosophy of Mr. Schafer’s approach to architecture, landscape, and interiors, and the second part covering four specific houses (including their floor plans and a detailed story of each house). As an added bonus, many of the houses are decorated by some of the most well known interior designers in the industry (Miles Redd, Michael Smith, David Netto to mention a few), as well as nationally recognized landscape architects. 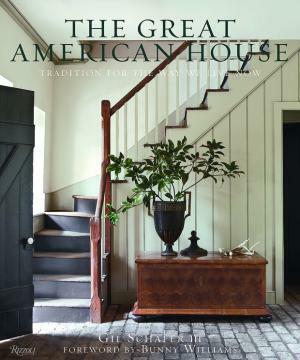 Each project is different, and the book beautifully discusses the unique process that makes each house a home. I particularly appreciate the floorplans of the houses, which helps me fully understand how the houses flow. I purchased the book as soon as it was published last fall, and read it cover to cover the day I received it. I highly, highly recommend it. When writing this post, I pulled it out and read it again – it is an exceptional architecture and design book. Click here to see on Amazon, and read some of the reviews (I loved Penelope Bianchi’s review). 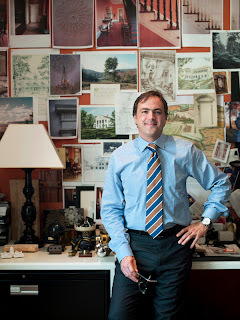 To join the ICAA-Southeast, please visit http://www.classicist-se.org/membership.html. To see the chapters all over the country, please visit http://www.classicist.org/membership-and-chapters/. Individual membership is $75 a year, and is fully tax deductible. Party photos by Tom Carpenter, used with persmission. The house is gorgeous! I love all of the old world features. The wall sconces in the dining room are so beautiful!!! I would love to find wall sconces like that for my own home. The house looks just like an Italian villa. Thank you so much for this wonderful post. Such a lovely post, Holly. There is nothing more beautiful than a home full of stunning collectibles. It was a very fine evening. I couldn't begin to take it all in. A stunning post Holly! And a house is beautiful beyond words. It looks as it is - thoroughly and thoughtfully collected not furnished and filled with objects in certain style. The interesting antique in the vaulted niche on image #12 is a fireplace (without a chimney attached) most likely made in Holland or Germany end XVIII - early XIX century and decorated in Empire style. This type was very popular in opulent Russian palaces and wealthy mansions. Thank you for this amazing tour. Love the house, LOVE the book. The ICAA is such a great organization - our DC / midatlantic branch should take note of this informal lecture series! The antique is a wood stove -they're found throughout Northern Europe and Russia - rarely used anymore but many are really beautiful! Holly, this was a fabulous post! Not only was it informative but it was oh, so beautiful! What a treat to get to attend this event in his lovely home! I'm so excited about the book! We've been looking for another great one to carry and perhaps this should be it! It sounds fascinating! Thanks so much for taking the time to share this with us! Looks like a beautiful house. It looks like it comes straight out of 19th century Europe! 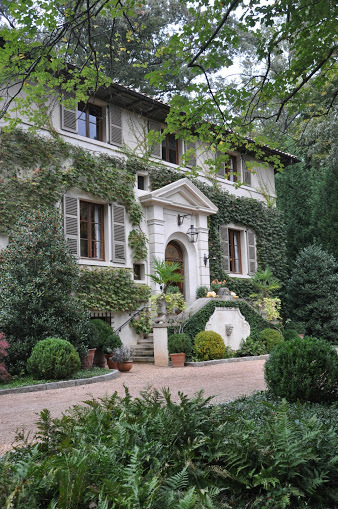 Our aunt lives in an 11th century villa in the hills of Florence and this beautiful home looks like it would fit right into the neighborhood. We can't believe it's only ten years old! What a wonderful evening you must have had. Thanks for stopping by The Buzz and for your sweet comment. Happy weekend, Holly. What a treat!! Absolutely beautiful, amazing how much of a difference the facade mades with the ivy, gives it such character. Just beautiful....the living room, walled garden, kitchen area, its all so fabulous. Fun event!! Have a nice weekend Holly! What a gorgeous home - so hard to believe it's only 10 years old - seems to have evolved over generations. 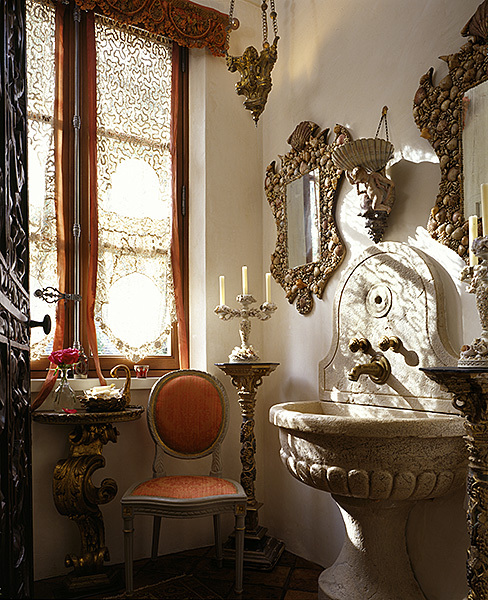 I love the powder room with the amazing sink and the garden...stunning!! I have Gil Schafer's book and it's one of my favorites. His architecture is classic, sophisticated and pure perfection. Happy weekend, Holly!! What an amazing villa, the garden space is beautiful. 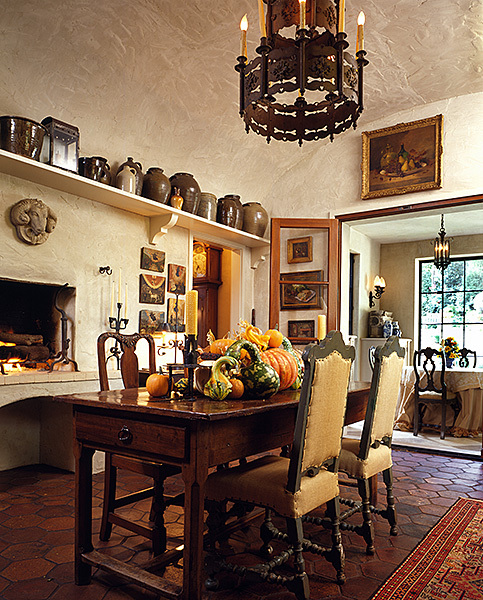 I'm inspired to bring my Italian vases out of storage, after seeing your photos, I think that is just what I need in my living room right now. I am just returning from 6 months in the South of France and am in the process of incorporating my french finds into the home, so this post is timely. I think that piece you were wondering about is a furnace, there was one in a chalet we stayed at in Switzerland. So pleased to find your blog. What a woderful home. I love the breakfast room. Thank you for taking us on an amazing tour. Yes, a great stove! A very handsome house. What a fabulous post! Indeed, that is a "stove"; or a a type of "heater" which burned wood and usually had a hole in the lower back where the smoke would be routed out of the house via a pipe I have one on my loggia. This is a beautiful one! In Scandinavia; sometimes all the rooms would contain these as the heating element! I love the collections! You can tell everything has a story! !